One of the UK’s leading manufacturers of professional cleaning and maintenance chemicals received a Chinese seal of approval recently. Arrow Solutions was praised for the performance of its cleaning solutions, its manufacturing facilities and its health and safety track record during a high profile visit from the Industrial Cleaning Association of China (ICAC). 24 delegates from 18 companies were given a guided tour of the company’s state-of-the-art facility in Moira and a detailed presentation into the firm’s desire to grow its presence in the Far East. 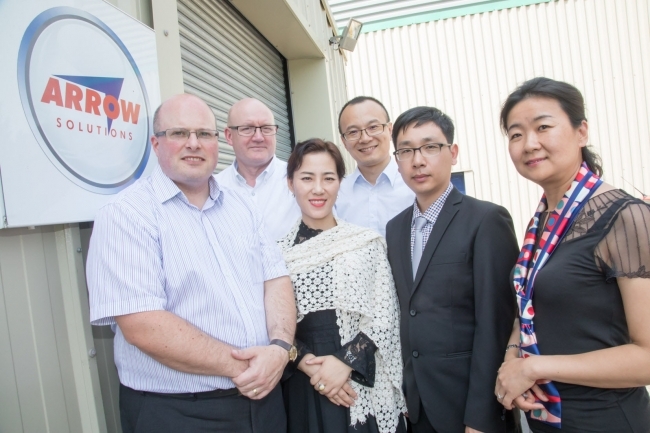 The group, which spent ten days in the UK, also received firsthand experience of the technical capabilities of some of Arrow’s key products, including industrial degreasers such as Lotoxane® and Aquaklenz LF, as well as Ecowash Autoshine, a train washing formulation already in use with several rail operators in China. “We were the only chemical manufacturer that the delegation chose to visit during their stay and that is a massive seal of approval for what we are trying to do,” explained Jonathan Lane, Sales Director at Arrow Solutions. The delegation was arranged to mark Arrow’s first birthday of its Shanghai operation, which provides sales, technical and warehousing functions to a growing customer base in the Far East. In just a short space of time, the company has already secured a number of high profile contracts with major organisations, such as the Aviation Industry Corporation of China (AVIC), Beijing Metro and China National Offshore Oil Corporation (CNOOC). Boyang Zhou heads up Arrow Trading Shanghai and has so far overseen the roll-out, promotion and expansion of its Far East presence. “This was a very interesting trip for our members as they got to see a world class manufacturing facility and how Arrow produce cleaning and maintenance solutions that could be really important to firms operating in China,” added Ma Chunling, Deputy Secretary General of ICAC.